I live in a household of People Who Are Not Fans Of Cauliflower. But cauliflower is really good for you, and my Hungry Harvest box sends me heads of it every now and again, so I do my best to serve it in ways that are not offensive to the people at my table. I came across this recipe in my ATK Quick Family Cookbook (which I use all the time! ), and everyone in my house has deemed it tolerable. Which, I know, is hardly a glowing recommendation. But coming from my family, it does say a lot. It’s been on my menu plan a few times, and you guys asked for the recipe. It was dark when I took these pictures, so please excuse any not-fabulousness. Done is better than perfect, I say. Oh, and this time around, I happened to have a head of yellow cauliflower from my Hungry Harvest box. So, I know this looks like curried cauliflower, but it’s really not. First up, mix minced garlic, olive oil, and red pepper flakes in a bowl. Then add 3 tablespoons of oil to a 12-inch skillet and heat it on medium-high until the oil is shimmering. This is an important thing, friends: high heat makes almost everything taste better. 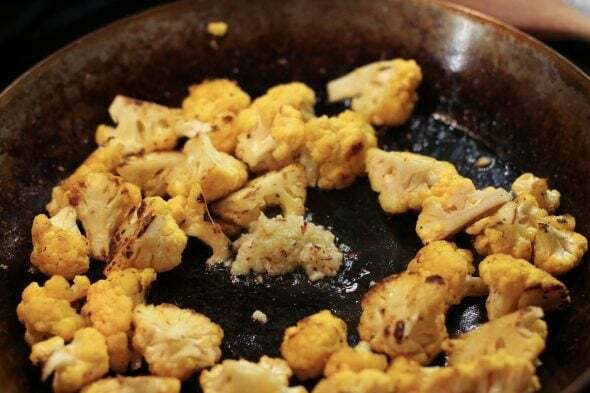 Add your cauliflower florets to the pan along with 1/4 teaspoon salt and cook for 7-9 minutes, stirring here and there. 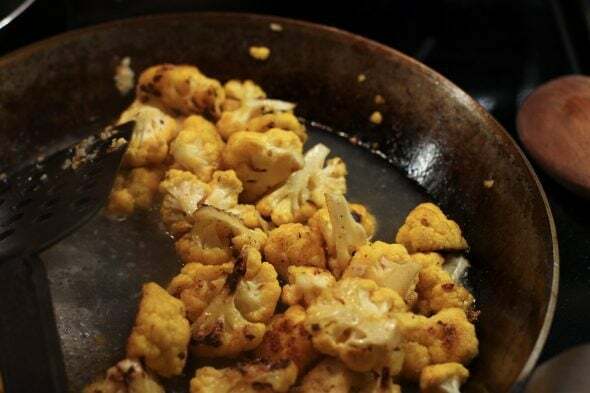 You should get some lovely browned spots, which definitely help the cauliflower taste more delicious. Scoot the cauliflower out of the center of the pan and add the garlic mixture. Cook that for about 30 seconds, and then stir it into the cauliflower. Next, add 1/3 cup white wine and 1/3 cup chicken broth. I just use cooking wine since I never have actual wine around the house. And I use homemade broth, which is not super salty. 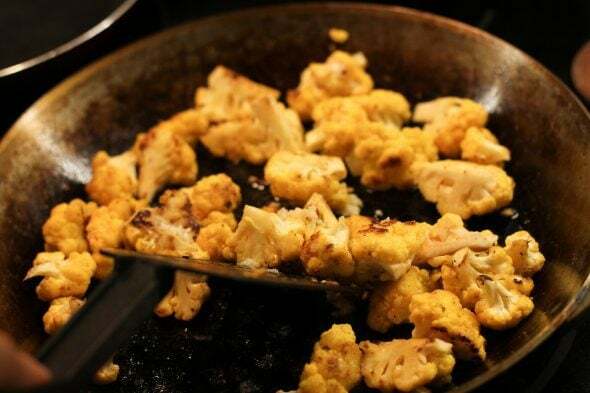 Cover the pan and let the cauliflower cook for another 4-5 minutes, or until it’s crisp-tender. And then you’re pretty much done! Add salt and pepper to taste, and more red pepper flakes if you wish. Easy, quick, and as my family says, tolerable. In a small bowl, combine 1 teaspoon olive oil, plus garlic and red pepper flakes. In a 12 inch skillet, heat 3 tablespoons oil over medium high heat until the oil is shimmering. Add cauliflower and saute, stirring occasionally, for 7-9 minutes, or until browned in spots. Clear center of pan, add garlic, and cook for 30 seconds. Stir garlic mixture into cauliflower, then add broth and wine and cover and cook for 4-5 minutes, or until cauliflower is crisp tender. Removed from heat and add salt and pepper to taste. Sprinkle parsley over top, if using. « Aaaaand here’s how my freezer challenge ended. This is exactly how we always cook it….my family loves anything with melted cheese on top! We used to be cauliflower haters, too! Then I discovered roasted cauliflower. All I do is preheat to 425 and then break down a head of cauliflower into florets. I often slice the florets in half, too. Then I toss with olive oil and salt and pepper and arrange on a sheet pan. If I’ve cut the florets in half, I arrange them cut side down on the sheet. 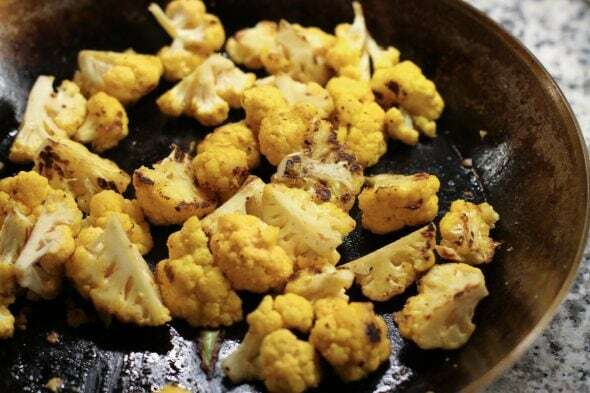 Bake 25-35 minutes and the cauliflower is beautifully browned and even sweet. That sort of gross raw cauliflower scent/taste goes away and it seems like a different food! This is also a nice method because it’s largely hands off. Totally agree. 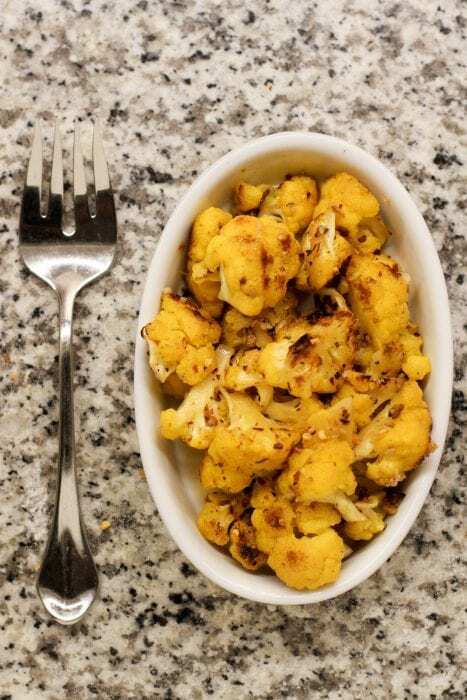 We love roasted cauliflower too! Also cauliflower tots are really good but a bit more work. Came here to chime in about roasting it as well. Totally a game changer! I roast here too with Olive oil, S/P, tarragon and a little Parmesan cheese. I will have to give this recipe a try. We loved roasted. I also cut up an onion and roast it with the cauliflower. Oh, that is such a smart way to use cauliflower! Garlic and oil makes everything taste good! Our new favorite way to eat cauliflower is to turn it into “boneless wings!” Lightly bread with flour, garlic powder, other spices, and then back for 30 minutes. Coat with whatever sauce we are using and bake for another 15-20 minutes. Your recipe looks so much faster! Yum yum! Every time I see white or red wine is added in a recipe, it reminds me of a French or high-end restaurant for some reason. I’m not a big fan of cauliflower either. My MIL usually put it in soup, so it’s ok. Lovely photos as always! I have some fresh cauliflower in my refrigerator right now. I will try this method for cooking it. It looks good, and who doesn’t like garlic, olive oil, and a few red pepper flakes? I really hate cauliflower. But how would broccoli be done this way? Would broccoli hold up or would it get overcooked? Fresh broccoli would work well, much better than frozen. Frozen is partly cooked already and so wet. Lol. Yuck. I think this looks delicious. Two of my four don’t like cauliflower, so I adopted the Jessica Seinfeld thing of steaming then pureeing the cauliflower, adding it to mac and cheese, mashed potatoes, sauces, soups, and (my favourite) banana bread. 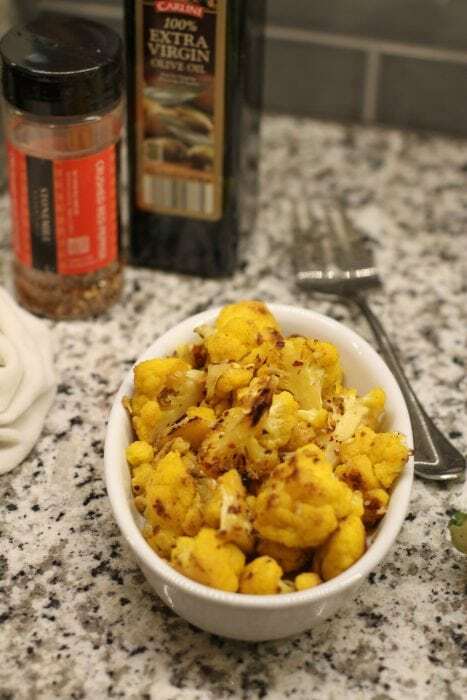 The puree freezes well and is not detectable for those that deem it “horrid.” I, however, could eat raw, roasted, and braised cauliflower all day and happily. Steam cauliflower and puree 1/2 c, set aside. Spray a 9×5 loaf pan with nonstick spray. In a ziplock, mix flours with baking soda, baking powder, salt, and cinnamon. Set aside. In lg bowl, mix the sugar and oil with a wooden spoon til well combined. Mix in egg whites if using, then banana, caul puree, and vanilla. Andd flour mixture and mix til just combined. Pour batter into pan, bake til a toothpick comes out clean…55-60 minutes. Let cool on a rack for 5 minutes then turn out onto rack to cool before serving. I actually LOVE cauliflower, but not raw, only cooked. This recipe looks delicious and I may have to give it a try – especially since it’s stove top and wouldn’t take too long. I usually serve roasted cauliflower when I make lasagna (CatMan’s favorite) because the oven has to be on anyway. I just cut it up, drizzle with olive oil, give it a sprinkle of garlic powder and stick it in the oven uncovered (at 350) for an hour or so – turning whenever I remember. About 5-10 minutes before serving I add a quarter cup of parmesan and stick it back in the oven. I would salt it too, but CatMan doesn’t like salt, so I just leave it plain and add my salt at the table. Either way, it’s sooo yummy! If your family doesn’t love cauliflower, you should try making Cauli Mash. It’s like mashed potatoes but easier, and happens to be low-carb too. Boil a head of cauliflower in salted water until tender. Put in a food processor (or use a stick blender if you have one) with garlic salt, some pepper, 1 TBS butter, 1/4 c sour cream, and enough milk to make it smooth. Done! It makes a great and easy side dish. So, does that ACTUALLY taste good? I see these faux-tatoes all over the place and I have just been super skeptical. Personally, I think mashed cauliflower smells terrible but tastes good. I would mix it half/half with mashed potatoes for my family though. Yes, it tastes great, but it’s important to get the texture right. Mashed potatoes aren’t grainy, so you have to get the cauliflower pretty smooth but not so much that it’s soupy. Adding some cream cheese helps the texture. 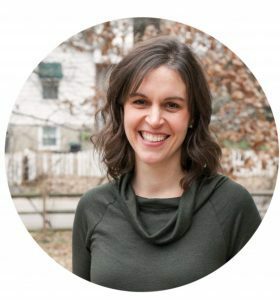 Kristen: I think mashed cauliflower is terrific but I need to watch carbs and am not crazy about mashed potatoes anyway. Last year I made a big bowl of cauliflower mashed with butter, sour cream, etc. and served as one of the sides at Thanksgiving. I was the only one who ate it LOL. If you have no dietary concerns, heck, just go for the real thing. I know this sounds odd, but this is the only alfredo sauce my son will eat. You roughly chop up a head of cauliflower (and remove leaves) and boil it until soft. If you are vegan (I am not), you can use some Almond (or other non-cow dairy) milk to thin the sauce. I use some of the cooking liquid (just scoop it out with my large pyrex measuring cup. 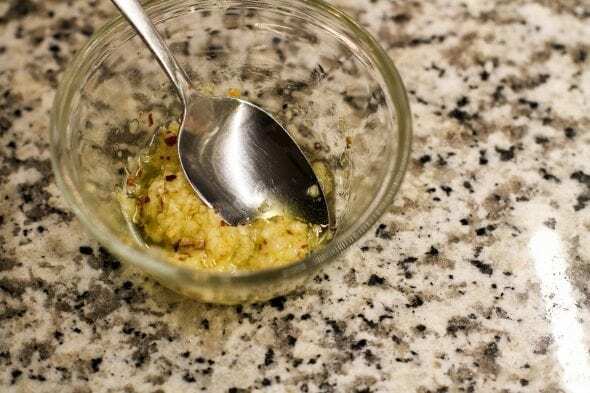 In a blender or food processor, add some salt, pepper, and if you are so inclined (I am often not), a little sauteed garlic and some onion powder. Add a quarter cup of nutritional yeast and puree the heck out of it. I just add liquid until I like the consistency of the sauce. I think I got the recipe from Oh She Glows. It is very simple, boil cauliflower, boil pasta, and away you go. I like cauliflower in this soup. I can barely tell the difference from a potato-only soup. It is so refreshing to see you use cooking wine. There are always so many saying to not use any wine you wouldn’t drink. Since I don’t want to make a trip into a liquor store for a bottle of wine to get a cup or less, I always just skip those recipes. If you say it’s good enough I definitely believe it. (Such a tiny amount in this recipe anyway.) I’m definitely trying this recipe, but I like cauliflower anyway. Yeah, if I were a wine connoisseur, I might think that cooking wine tastes awful. But I’m not anything close to that…I’m not opposed to drinking wine, but it’s really just not my thing. So, cheap cooking wine is perfect for me. Yum! that looks really good but then I love cauliflower. I agree with previous comments, roasted cauliflower is sensational. Try a few pieces mixed in with your next roast – it does take only 30min though. I sometimes roast the florets as suggested and then mix with a gremolata of fried bacon pieces and garlic, then when this is cooked add a knob of butter and some grated lemon rind then toss in 5mm cubes of sourdough bread, mix with the roast cauli then mix through a good handful of flat leaf parsely – not one for most kids but my sis and I love it. In Australia there was a craze a little while ago to whizz cauli up in the processor and use it instead of rice in fried rice, you can also make cauli pizza bases. I love small pieces through homemade mac and cheese. …there is also a pie shop near me that does a cauli-cheese roll with puff pastry like a sausage roll which is delish. I don’t drink wine either, but I almost always have a bottle of white wine and vermouth around thanks to America’s Test Kitchen. They dont like cooking wine. I think it is because it was more acidic and has more sugar in it. I can definitely tell a difference. I highly suggest buying just a cheap bottle of regular wine to keep around for cooking. And I’m sure you can find more on the science at the ATK website. Ps. I highly recommend adding 1/4c. White wine to the quick risotto and shredded chicken recipe in the quick cookbook (and cut the parmesan cheese in half). It is one of our favorites from that book. I am not a traditional wine drinker, but when I learned that “cooking wine” sold in the grocery stores could only be sold there (assuming it’s not a grocery with a liquor license) because they add so much salt to make it undrinkable, I refused to buy it. I have a physical issue with sodium. I just keep a cheap bottle of red and white in my fridge for recipes that call for wine. Burgundy is even better most times, especially in oven-bag pot roast, subbing it for half of the water (or more) called for. I want to go buy some cauliflower right now to make this dish. Looks yummy. Hubs also hates cauliflower (which I don’t really get, because I don’t think it tastes like anything) so this recipe looks great for us! You definitely had me fooled with the yellow cauliflower! 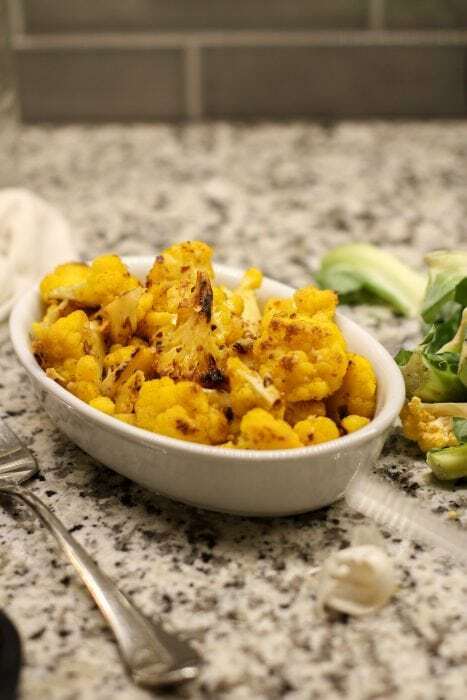 I’m glad it wasn’t curried though – I just want an easy way to “spice” up cauliflower! I learnt from Nigella Lawson that you can freeze wine, she puts the leftovers from a bottle in half cup measures in the freezer. It won’t all go hard like ice because of the alcohol; more like a slushy but it works great. I find risotto much better when the first ladle is wine before the stock.